Garden trellises, arbors, and pergolas offer shade while highlighting points of interest. These landscaping elements may serve as vertical planting surfaces covered with climbing plants for a garden that stretches towards the sky. They can also be left bare so that their architectural design may accent home and property. Like garden walls, they can create outdoor rooms and serve as private gateways. Whether serving a traditional, rustic, cottage, or contemporary style, these features can be important elements of a landscape design because they invite family and friends to linger longer in the garden. 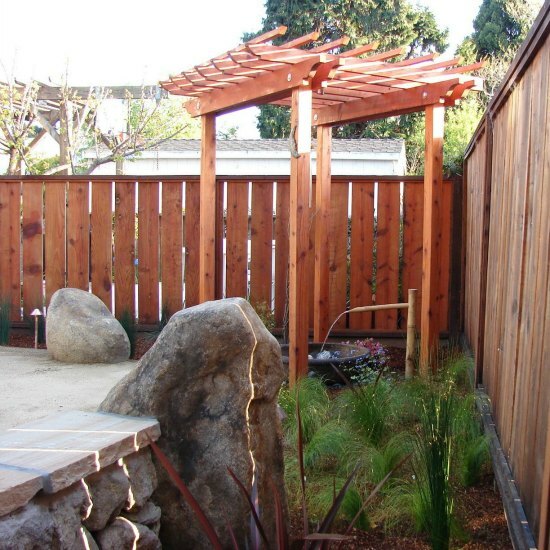 Wooden trellises generally support vertical plantings and can range from simple pieces of latticework to elaborate, stand-alone structures. In addition to adding beauty and visual texture, they may also be used to obscure unsightly, but necessary, property features, like utility meters, recycling cans, and power transformers. 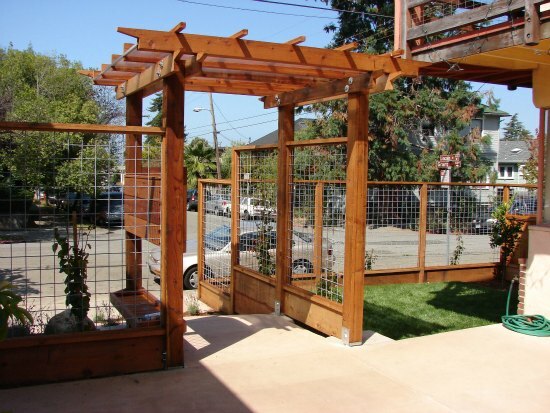 In addition to providing accents, shelter, and personal privacy, trellises also add vertical visual appeal. Wooden arbors, which are generally larger and more substantial than trellises, are arches on which plants can grow. They can also create outdoor rooms, which give a sense of drama and mystery to a property. Whether set in fences, hedges, or walls, they can create passageways within a garden or serve as formal entrances. However, they can also be stand-alone structures that add height and elegance to a yard. Whether serving as gates, or as destinations for midday relaxation in dappled shade, arbors beautify outdoor living spaces. 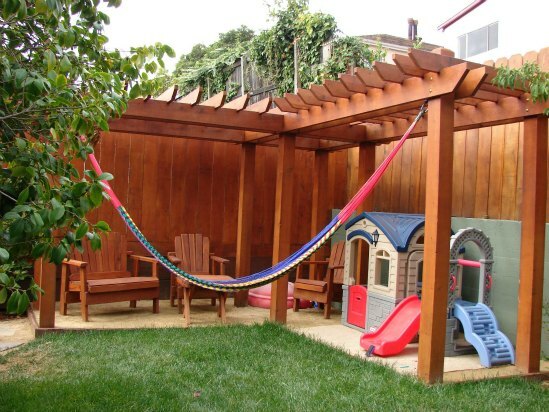 Generally larger than arbors, garden pergolas have columns that support overhead beams for growing plants. 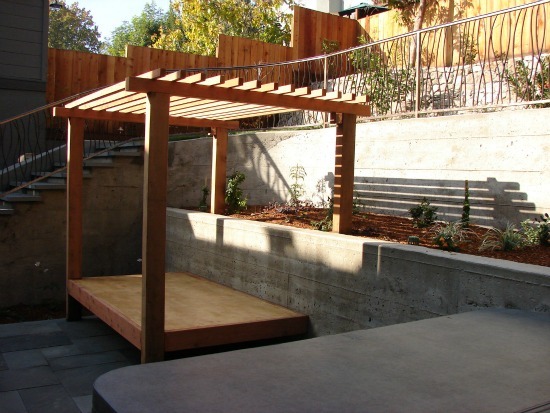 Well-executed pergola designs will create shady retreats. They can also serve as dividers for rooms within a yard, or connections between different outdoor spaces. Originating in ancient cultures around the Mediterranean, pergolas are garden features that are experiencing resurgence in popularity because of the style and comfort they can bring to a garden. Trellises, arbors, and pergolas soften the stark lines of a home when creating a modern garden. And, the modern garden is no longer just a space to exhibit plants. It is an artistic expression, a healing sanctuary, and an extension of the home. Therefore, excellent landscape design must relate the garden to the house in a marriage of style and function. Sarah Ray Landscape Design specializes in the subtle balance between the framework that defines the outdoor living space with the garden features, planting, and structures of the property they serve. Our construction and placement of garden trellises, arbors, and pergolas increase curb appeal while creating harmony between the functional and aesthetic needs of a property.